Two weeks ago, with the Oakland Raiders leading the NFL in penalties, head coach Jack Del Rio said that he had “zero tolerance” for unnecessary mistakes by the team. His tolerance today was apparently not in absolutes, because the Raiders set an NFL record with 23 penalties for 200 yards in an overtime victory against the Tampa Bay Buccaneers. At halftime facing a 10-3 deficit, the Raiders had earned 10 flags for a total of 86 yards, committing infractions from taunting to pass interference to illegal formation. Oakland managed to come back in the second half and force overtime, but the flags kept piling up. Oakland’s 23 penalties broke a 72-year-old record for the most in a single game, though the team finished short of the yardage record of 212. The 23 flags didn’t include the three penalties Tampa Bay declined, and one which was offset by a Bucs penalty. The most frequent culprits were holding and unnecessary roughness, each called four times. For comparison, Tampa Bay committed six penalties for 64 yards. 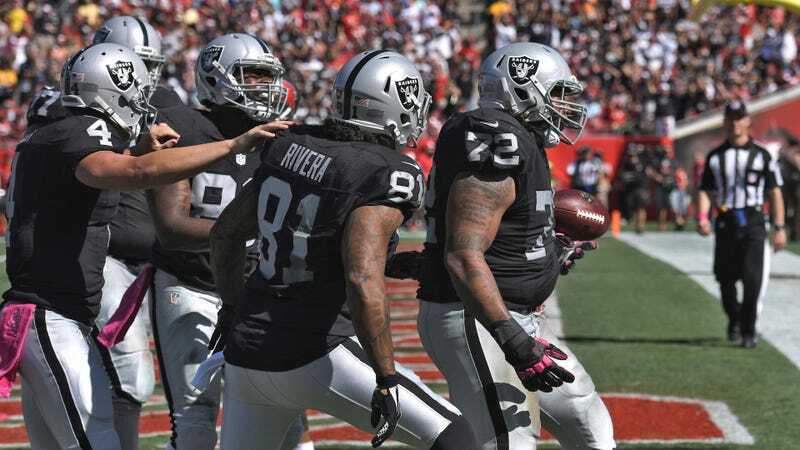 Derek Carr connected with Seth Roberts for an overtime touchdown—one of four TD passes in his 513-yard day—that gave the Raiders the 30-24 win. Imagine how they would’ve done without all those flags.